Our services are warm, user friendly and personal. We've designed the services so that you can actually enjoy them! Every Jew is an automatic member, and is welcome to attend free of charge; yet your generous donations are welcome and needed to enable us to continue. Our High Holidays budget is $20,000 - click here to support our High Holidays services and events. 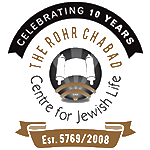 All services and meals will be held at The Chabad House - 251 Albert Street. In addition, there will be a short and sweet Shofar blowing service at Silver Lake in Waterloo Park on Monday, September 10th at 5:00 PM. for the services and meals you plan on attending.